Japan with some brief poaching against USA in the final of the World Championships in 2016. In this video I’m going to look at the Japan-USA World Championships final from 2016 – specifically the Japanese defence for one particular point. They do some interesting stuff – it’s not the very advanced switching defence they do that I’ve looked at in other videos and articles, but they do do some interesting things nonetheless. I noticed it whilst watching and thought I would make a quick video to look a bit closer. Enjoy! First look at #22’s movement after his mark releases the disc. He has moved downfield and created separation, narrowing the crossfield throwing channel. Now watch #97’s movement after the disc is released. Significant separation is created. Again, watch the next defender’s movement after Beau releases the disc. He moves downfield quickly and tries to cause some trouble for the offence, distancing himself from Beau in the backfield. But wait, it looks like Beau is marked by somebody else now? How did that happen? Keep your eye on these two. You can see it was not an actual switch – it was just an illusion caused by the movement of the Japanese defenders. At this point the flow stops and there’s an immediate pick, so let’s rewind a little. Here is the defender that ends up appearing to mark Beau. You can see he leaves his mark – Cassidy Rasmussen – whilst staying super-aware of everything that’s going on around him, covering Beau to help his team mate. He keeps an eye on Rasmussen so he’s able to close him down quickly when he becomes a threat again. This movement by the Japan defenders is so repetitive that I believe it’s a specific tactic they are employing. In the conventional style of ultimate, the first few seconds of the stall count are almost always spent looking for a positive-yards throw. By overloading this area early in the stall count, Japan are attempting to counter this offensive trend, knowing it’s unlikely USA will throw backwards immediately. In this point, Cassidy Rasmussen finishes the offence off with some clever footwork – but later in the game the tactic did cause a turnover – one of only three of USA’s turns in the game. If you want to see more analysis on that turnover and the other 8 turns in the game, take a look at the video linked below. I hope you enjoyed the analysis – I know it wasn’t anything particularly ground-breaking. I think you could describe it as a flash-poach, if you were to use conventional ultimate wisdom & lexicon to describe it. I hope you got something from it, and enjoyed watching a point from that game, which is a brilliant game which I recommend you check out in full – I’ll be looking at other points of this game in the future. Subscribe and like if you want to see more! Quick analysis of a failed switch by San Francisco vs Seattle in this AUDL match from week 16, 2017. After some heated discussions on reddit, this video compares the contrasting throwing styles between Jimmy Mickle and Frank Hugenard. In this video from the 2017 World Games we’re going to look at how Colombia adapt their offence to effectively counter the one-to-one defence Poland play against them. Transcript: During the game it became apparent that the Colombian women were winning their matchups with greater ease than the Colombian men. To play to this advantage, Colombia manipulate the space on the field to reduce the risk of clogging and poaching from the male defenders, and maximise the space available to the women – in this case on the far sideline & deep – whilst the men are concentrated in the near-side and backfield areas. There is some initial poaching from the male defenders, but the Colombian men stay involved and calmly take the open pass. The women on the far side have now formed a triangle, they are no longer being inhibited by the poaches, and they have a clear channel to the end zone. Note how the male players resist the urge to reposition downfield when the disc is near the sideline, instead trying to draw their defenders away from poaching positions. Once the Colombian women are in flow the offence looks fairly unstoppable, with the defenders not able to apply any real pressure, however in the end the turnover is caused by an unforced execution error. Colombia get the disc back later in the point, but the women are disconnected at the start of the offence, and there is some sagging and poaching from the defenders. 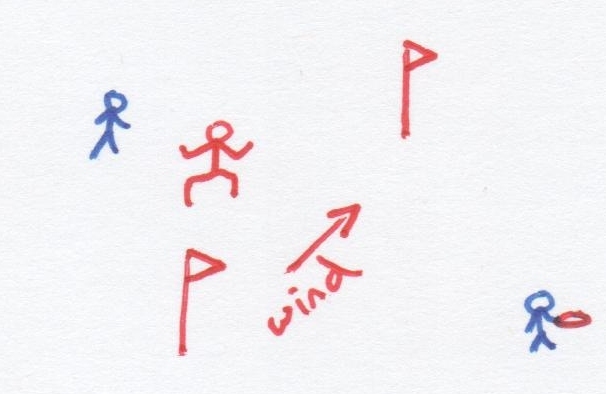 When one of Poland’s male defenders gets sucked in on a poaching opportunity, their mark rightly takes off deep, but the disc doesn’t come and when he comes back we see Colombia fall into a similar setup to the one we saw earlier. The women retain their shape deep on the far sideline whilst the men take a few easy open passes to keep the tempo of the offence. The triangle shape makes it very difficult for the Polish female defenders to poach or switch effectively. When Lauras Ospina gets the disc, Colombia have a favourable one-to-one matchup completely isolated in the attacking half of the field, where Yina Cartagena scores without the defence having a bid. By utilising the space on the field, manipulating the defence, and taking the open pass, Colombia were able to play to their advantage – their female one-to-one matchups – whilst minimising the poaching opportunities for the male defenders. Utilising space and manipulating defence happens with all offenses, but which offensive structure would be most suited to this gender-weighted tactic? Vertical stack creates space down the sides of the field but is very susceptible to poaching, as one or two male defenders start in the centre of the downfield space. 4-women in the stack with the three men in the backfield is possible, but is open to counter-tactics such as defenders sagging off the handlers, or downfield defenders surrounding the vertical stack to make it overconcentrated and difficult to initate flow from. Splitting the vertical stack takes things to the extreme – it maximisises the space available, but it asks cutters to make big initial movements to get free. This is well suited to the hard cutting, yards-focused style which is prevalent in the game at the moment, particularly in North America. How about horizontal stack? 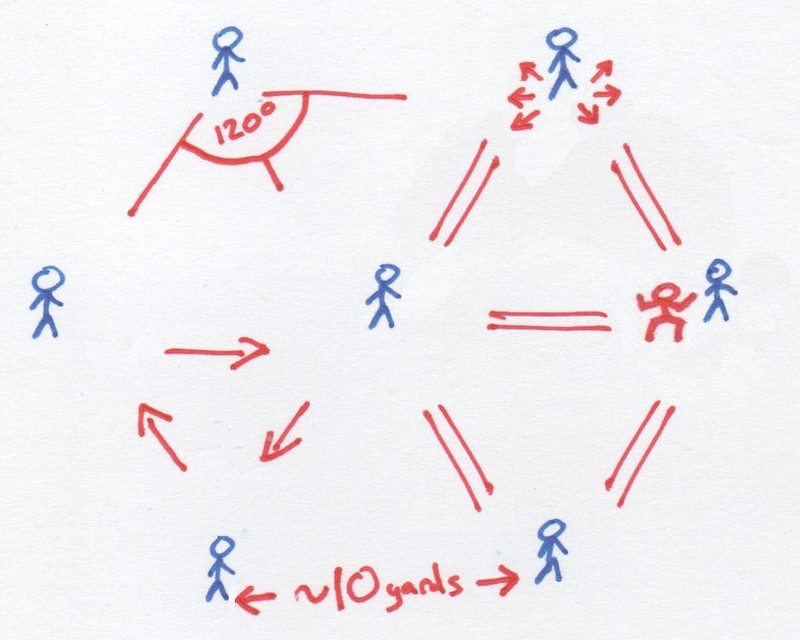 This is more dynamic and can work in a few different ways… when there are two male defenders downfield poaching could become a problem, so having three downfield female players can work nicely, offering loads of space… My favourite setup – which will come as no surprise to anyone familiar with my work – is called Hexagon Offence. 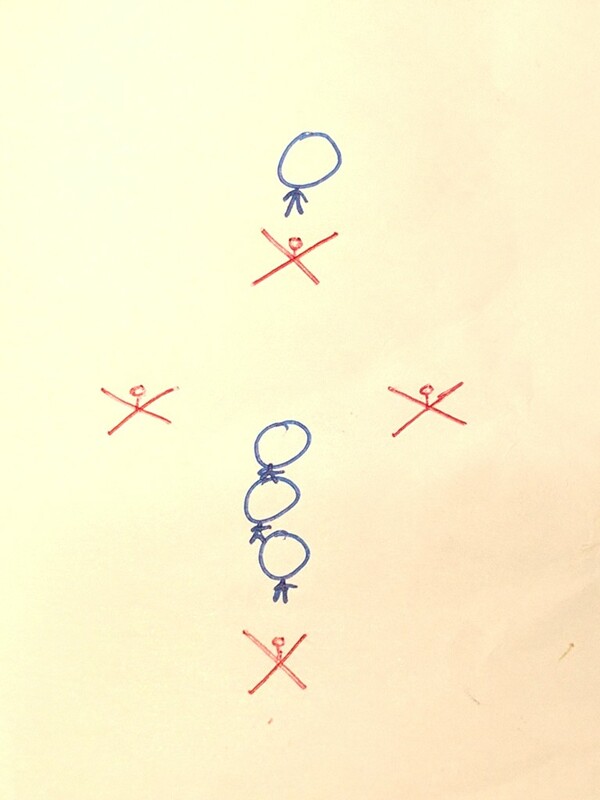 This setup naturally supports the triangle shape Colombia’s women were forming, whilst keeping every other player connected, meaning any poaching can be quickly and easily punished. Space in the Hex setup is created dynamically – when one player makes a cut they create a space where they came from, which is not how it works in vertical or split stack. This new space can be used by any adjacent team mates, and unlike horizontal stack, these second cuts can be made directly from the setup positions within the Hex shape. This dynamic creation and use of space has a cascading effect which maximises options for the offence and denies the defence any leverage. Hex has taught me a lot about Ultimate, and there’s a bunch of other reasons why I prefer it to traditional offences, but I digress! I can talk about that more in another video. If four women are on the field winning their matchups – perhaps related to a lack of female subs from the opposition – then a number of other interesting setups are possible to make use of this advantage. I didn’t get a chance to speak to Mauricio Moore, the Colombian coach, about this video at all, so it’s just things that I’ve kind of seen, and my interpretation of them. He did an interview recently which is really really worth checking out – it’s a subtitled one, it’s in Spanish, but the subtitles are great, he’s clearly got a way with words, I’ll put the link down in the description below. Definitely check it out, I think everyone can learn from his experiences and what he has to say. He says they focus very little on on-field tactics, so probably they just identified that the women were mismatched and just encouraged their men to just stay back and out of the way whilst the women had their own space to work with, rather than it being something they had drilled or it being a formal structure or arrangement they had. In this way I think they’re similar to Japan in terms of national teams, in that they’re more dynamic and organic with how they play, rather than sticking to set rules and cutting patterns and reset patterns, they kind of make it up as they go along to a certain extent, which is an approach that I really like. Transcript: Most notable in this video is the angle Arakawa takes when cutting deep. Conventional deep-cutting wisdom states that deep cuts should be made in a straight line aimed at the back of the end zone, in order to give the thrower the largest space to aim at, and the easiest read for the receiver. Arakawa’s diagonal deep cut, although a harder throw and read, is difficult to defend against if done well, as the deep-break space is usually a defender’s lowest priority. If the defender takes a straighter line deep, it immediately gives Arakawa lateral separation which he can use to cut under. He times his deep break-side cuts perfectly for the throwers to be able to catch, turn, pivot, and release smoothly, putting the disc out to space. Flags is a simple game which adds training elements to a throw around. It will expose your weaknesses and challenge your strengths. Set out two markers (water bottles are good) a few yards apart, one directly downwind of the other – these mark the goal line – the windier it is, the longer the goal line should be. The higher the skill of the players (and/or the lesser the wind), the narrower the goal line. 3 players: 2v1 – Rolling defender, cutting now encouraged. All players can move freely and pass on either side of the flags, but only passes across the goal line (at any height) count as goals. Goals reset a shot clock to prevent stalling, and the shot clock can be counted by the defender from anywhere on the field. Felix, Will and Edgars play 3-player Flags.3v2 / 4v3: More players can be brought in both on offence and defence, and the goal widened. Experiment with different goal sizes, goal orientation to the wind, restricting the surrounding space with back lines, and so on. I recommend stalling from 4-10, as this is most game-like – mimicking the common situation where a thrower looks for a secondary option at stall 3. Let me know if you come up with some interesting rules or modifications yourself! As it was written on the back of the first frisbee – Play catch. Invent games. Have fun. This weekend I won a bronze medal at the Euro Masters Club Championships in Frankfurt, playing hex with a mostly Belgian team – Moonwalkers! Tof, who captains the Belgian team Mooncatchers and with whom I played Shocker @ Paganello a few years ago, got in touch to invite me to play with what I assumed was a Belgium-based / Mooncatchers masters club team. Turned out the only thing we all had in common was that we knew Tof! We had three players from Brighton (Roach, Edgars and myself), three Mooncatchers, six from other teams in Belgium, and three players from France – so most of the team were familiar with seeing each other on the field as opponents and competitors rather than team mates. On the first day Tof told the team that I was strategist along with Olivier (Mooncatcher founder who has been playing since the 80s). For our first warmup we played Keepdisc – Ultimate without endzones – as this got us passing the disc around in very Ultimate-like situations, getting to know how each other cut / pivot / throw / fake in fluid situations, so we learn a lot more about each other than if it was a rigid drill. We played Keepdisc to warm up before every game for the rest of the tournament. First game we played against D.O.M from Germany, and ran Mooncatchers-style D – work as pairs downfield switching and sandwiching, whilst handler marks play tight one-to-one defence. This progressed into a heavy focus on stopping the under passes as we realised D.O.M were very reluctant to throw deep – strange for a masters team! We took the game 15-11, a great victory as D.O.M went on to beat one of the finalists later in the group stage. Before the next match I explained some of the principles of Flex defence – communicate, switch/sandwich where appropriate, and maintain coverage of every offence player. We went into the next game with a more formulated approach to switching and sandwiching, so it was less chaotic than the defence of the first game, and worked well as we beat Wolpertinger (DE) 15-11. Last game of the day was against 7 Schwaben, I was unable to play due to heel pain so contributed from the sideline with strategic manipulations – forcing middle worked well, we switched it up to a zone until they called timeout, at which point we switched back to forcing middle so that they never got to adapt – a 15-8 win. The next day was tough – we played Deduska (RU) and Wizards (SUI), both were very strong on both offence and defence, and although we got turnovers we weren’t able to convert enough of them and made too many mistakes on offence, so lost both games and lost out on a place in the final due to a three-way tie. On the final day, we first played Raging Bananas as our last group game, before meeting Wolpertinger again in the Bronze 3v4 match. Before the Raging Bananas game I took some time with the team to explain Hex offence, as we had only been playing horizontal and some vertical up until then. The players were quite comfortable playing a fairly organic style (this is normal in Belgium, to fall into organic style after an initial setup), so I emphasised that there was total freedom in Hex outside the basic principles: Take the open pass, create/use space as you see it developing, and maintain the shape. Other than that, just do what comes naturally. The first two principles were easy to explain / natural to perform, so we quickly went over what the hex shape looks like on the field, emphasised that you shouldn’t surround the disc, played some Keepdisc and then got straight into the game. Hex offence against Raging Bananas looked amazing – the scores looked to be easy, there was always an open pass free, and the flow looked unstoppable. Of course it is impossible to say whether this would have been the same if we played another offence, but at the very least it was a great way for the team to learn how to setup and the flow from the Hex structure, and gain confidence playing it. We took the match 15-6. Then onto our final game, against Wolpertinger, for the bronze medals. For plenty of our team this was the highest level game they had ever played, so before the match I told everybody that we did not need them to do something extra special, they just had to give their 100%… to resist the urge to try to give 110% and be extra amazing, but just to be the same players as they have been all weekend, putting in the maximum effort and doing what they know will work. For example, rather than trying for a pass that will only work if it is a great throw, just make the pass which will work for a normal throw, as this is all the team needs to do to win each point. It’s interesting to note that, in my experience, players will often change how they are playing in a meaningful final match – either by saying more stuff to the team in between points / in huddles, or playing in a different style. The bronze match was an amazing match by all accounts. We played Hex offence the entire way through, and it was 5-5 before the first turnover of the game. We got the first break, they broke back a few points later, and the points became longer – Wolpertinger tried a few times to play zone defence against the hex but we were very patient and used lots of accurate hammers to swing and score. We took the third break of the game in the second half to go up 13-11 in a game to 15, they stayed with us so we were on offence 14-13 up, they come down with tight one-to-one defence but we flowed downfield using the hex shape until we were near to the end zone. Olivier had the disc and couldn’t throw back to me or up the line, so I found myself near the end zone not really able to help when the stall was on 8… Olivier sees Tof coming under on the break side under a lot of pressure, makes the throw, Tof goes up high and fast with a bidding defender next to him, takes the catch down… I make three hard steps to the flick side and then plant and turn to look over my left shoulder, Tof sees me and puts up the hammer, I have time to get body position and go up with two hands, and secure the catch! I hold the disc up high and hug team mates as tears come to my eyes… what a game, what a tournament, what a team and what a medal! Strategically I learnt that it is quite easy to implement Hex Offence with experienced players even if there is a variety of ability and they have not played much with each other before – helped by the tendency to be comfortable playing a more organic style in Belgium. It is harder to implement Flex defence for a couple of reasons:- it tends to break down if one player begins to poach – which is very tempting – and the positioning and movement in Flex is very unlike one-to-one or zone defences, so players are not used to it and have to learn it afresh. The positioning and movement in Hex offence is very similar to ‘organic’ or ‘fluid’ offence – which is something that happens in practically every point of Ultimate when the stack formations break down after a few passes, therefore players are used to it and so Hex doesn’t ask them to do very much different to how they normally play – just to ‘maintain the shape’ (which entails knowing what the shape looks like). Hex is essentially a set of guidelines which facilitate and support organic flowing offence, whereas Flex is an alternative approach to defence which introduces a number of new concepts and asks far more of players. Had a great weekend with the Moonwalkers, winning a European medal (and the first medal earned by Hex offence that I know of – though Cape Town Uni may have won SA Nationals with it last year), meeting lots of fun players from Belgium & France, and I hope plans come together for us playing more in the future! In this video I’ll look at Clapham’s intense defence which results in a turnover against Chevron at a critical point in the Tour 3 2017 Final. First look at Justin Foord on the mark, forcing away from the camera. As Ben Burak catches the disc, Foord is moving quickly to cover the break side. As soon as Burak plants his left foot and shifts his balance to his right, Foord mirrors. Burak then throws a shoulder fake, which Foord moves slightly to the right to cover, staying balanced enough to be able to get a foot ready to cover the inside-out flick threat. He keeps his balance and positioning, so Burak doesn’t even pivot for the around backhand as he knows Foord is still covering it. Burak then threatens the inside-out flick again, and note how it’s Justin’s right foot that moves first. This puts him in a much better position to be able to stop the throw, and means that his resulting balance is automatically aimed towards recovering his position to stop the around backhand break. Watch again how closely his footwork matches that of Burak’s. From this angle, notice how Foord doesn’t kick his foot out for the first flick fake – Burak has wound up for the throw but does not pump the fake realistically, so Foord essentially winds up for the footblock, does not commit to it. This is a masterclass in appropriate reactions to a thrower’s movements – he respects and matches each move, without overcommitting at any point. Now let’s have a quick look at Ashley Yeo, #20 for Clapham. He makes a decision to dial back his coverage of James Mead’s break side cut when he sees Burak is not going to attempt the throw, meaning the short break area of the pitch is no longer an urgent threat. By dialling back at this exact moment, Yeo makes the window behind him smaller, whilst also using his energy efficiently. Note the quick chain of events – Burak pulls out of the throw early, Yeo changes his coverage, and Parsons, #25 for Chevron, pulls out of his cut. The two Clapham defenders on the far side maintain close coverage, forcing their marks towards the clustered area, denying any easy reset into the space behind them, and also contributing to Parsons’ decision to pull out of his cut. Ben Funk catching the D greatly increased Clapham’s chances of converting the turn, they instantly split the deepest defender and punch it in. But what could Chevron have done differently? After working the disc over to the break side, #50 Sam Turner gets open, albeit for a break throw. Burak should put more energy into trying to get the disc to Turner – even if this pass doesn’t happen, the effort would move the force further around to open up the inside-out channel, it would communicate to Turner that the pass wasn’t coming and encourage him to clear the space faster, and it would get his defender committing to stopping the pass, which would potentially open up a deep option to Turner. This is a very fine point and only a narrow opportunity – at this late stage in the game, the big differences are to do with how the offensive and defensive strategies have adjusted to counter each other, and although Clapham are playing excellently individually, it’s likely a team-wide approach which has exploited the weaknesses in Chevron’s offence. I hope you enjoyed this video, go to felixultimate.com for more analysis and strategy articles. Audio/video analysis of each of the nine turnovers in the Worlds Final from last year. In this video I’m going to look individually at each of the nine turnovers in the 2016 World Championship Men’s Final between USA and Japan. Keep your eye on Freechild, who will get the first D of the game. Notice how he takes the initiative to reposition as the disc moves. He’s keeping half an eye on the disc, meaning that when it is thrown for a swing, he is able to react a fraction of a second before Japan’s captain Kichikawa, and has position to get a fantastic layout D.
But wait a minute, where did Rehder come from? Three passes before the turn, Gibson appears to be initiating a sandwich or bracketing setup with Rehder, using gesticulation to communicate this. This means Rehder is better placed to cover the break side. Like Freechild, Rehder keeps an eye on the disc and reacts very early to Japan’s attack, putting himself in a great position to clean up with a completely necessary D.
Kolick uses his position to keep half an eye on his mark, and half an eye on the field. It takes him one fifth of a second to react to Arakawa’s in-cut – he puts three hard steps in before getting a visual with the thrower Matsuno, who goes ahead with the throw because his view of Kolick was obscured by the force. Point of note – Kickikawa and Tanaka’s close positioning here means Kolick and #24 Sefton have the opportunity to gain advantage through sandwiching and switching. Sefton should have covered Kolick’s mark as he drifted deep, as this would have allowed Kolick to make his poaching bid without exposing any significant vulnerability if the bid was not successful. This is an incredible athletic block from Kurt Gibson. It’s possible he was able to be particularly tight due to anticipating Kichikawa was going to change direction when his first move was aimed towards a teammate. Just before the disc is released, Gibson is accelerating towards the exact point an accurate throw would be aimed at. His tightness keeps open the options of going either side of Kichikawa in the case of an inaccurate throw. #88 Katsuta sets up a sandwich (or bracket) with Arakawa when he sees their marks are close together. Playing heads-up, he sees Rehder’s under cut, checks if the disc will be thrown, and actively repositions. Making full use of the freedom given to him by the deep coverage of sandwiching setup, he’s sees Gibson’s up-line move, and simply needs to build on the momentum given from his active repositioning in the sandwiching setup to go and get the interception. As Matsuno catches, Arakawa sets off deep for their classic crossfield break flick huck connection. Russell Wynne puts a bid in on the force, as Matsuno releases the huck less than one second after catching the under pass. Slightly less angle or slightly less power and this would be a goal, but as it stands, it’s an execution error on Matsuno’s part. Japan’s defence is looking very zonal after several turnovers in this point. #6 Kurono doesn’t fully commit to cover Nathan White’s deep cut as he can see Matsuno is helping out, and the window which White could receive an uncontested pass in is actually very small. This has to go down as a decision error by Trent Dillon, who had a wide open under pass available. White retracts his foul call after discussion, in a great display of normal spirit. Arakawa cuts diagonally deep to the break side again, but slows up early because the thrower – Kurono – hesitates on the throw. When Matsuno throws to Arakawa from similar positions, his catch-pivot-release is always smooth, so when the thrower hesitates, Arakawa mistakenly believes the throw won’t come. If you watch Arakawa’s steps after the hesitation, you can see he slows and then speeds up. Tom Doi was close enough to have a bid on any throw, so the turn goes down to a combination of miscommunication, execution, and decision making. Japanese defender Komori chases the disc as soon as it is released in order to cause trouble downfield, getting a phantom D on Beau Kittredge’s infield pass to Cassidy Rasmusen. Phantom blocks, where a defender does not touch the disc with their bid but is rightly responsible for the turnover, break the catcher’s concentration as they start thinking about the potential interception, as well as often giving a visual distraction by changing the background to the catchers view of the disc. Point of note: If Beau had inverted his pivot – gone to the disc and turned to his right instead of his left – he would have seen the poach arriving. Sad turnover to end on, but some interesting stuff nonetheless. When this stall-9 disc is released, neither Jimmy Mickle nor Josh Markette have the thrower in their field of view, which means #3 Takahashi just needs to put the disc out to space. Kurono had the easier catch, but Koike wasn’t leaving anything up to chance and committed to the layout. His first fake is excellent, and when Mickle bites he should ‘cash in’ on the fake by passing to Kurono, who has an easier shot at the Japanese player downfield on the far sideline. Instead he breaks the flow somewhat by faking the inside-out backhand, putting energy into a full fake which doesn’t accomplish much, and which didn’t seem like a realistic throwing option. He turns to Takahashi and – oopsie – puts the disc out, as he moves… classic miscommunication error. And one and a half turnovers were due to miscommunication. I hope you enjoyed this video, obviously it’s been quite critical as the subject is turnovers, I recommend you check out the full game on YouTube and go to felixultimate.com to have a look at my other analysis pieces on this match, including a breakdown of Japan’s unique team defence, and a comparison between how each team approaches fielding the pull.